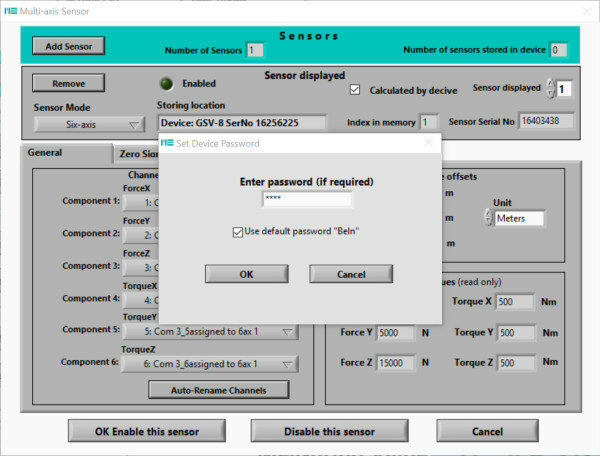 With the "Special Sensor" button in the main menu you can access the settings for "Multi-Axis" sensors (K6D, K3R, F6D, ...). 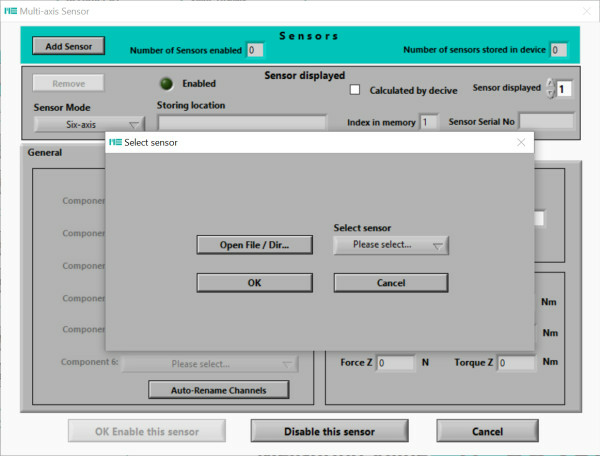 The "Add Sensor" button opens the dialog for opening and loading the calibration data. The calibration data are loaded by a file named "Serial number.dat". Please make sure that the file / files with the extension .matrix are included in the same folder. 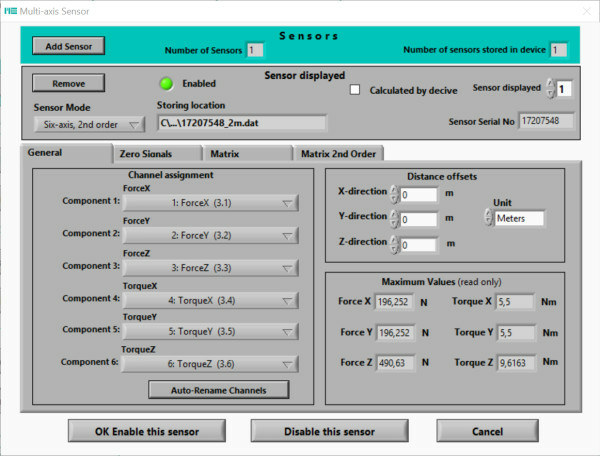 Check the nominal forces and moments and the serial number of the sensor. Optionally, enter your operating point, at which the moments are to be calculated. 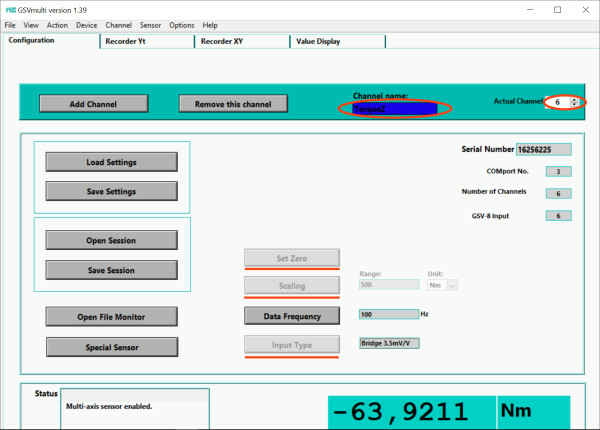 The channel names "ForceX, ForceY, ForceZ, TorqueX, TorqueY, TorqueZ" are optionally assigned by the "Auto-Rename.Channels" button. 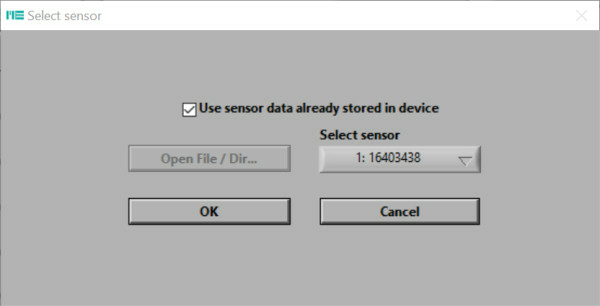 The data is accepted by "OK Enable this sensor". 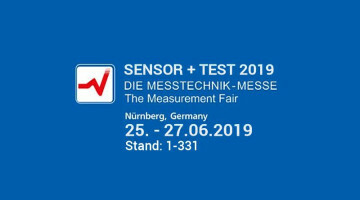 With the checkbox "Calculated by device", the internal calculation of the calibration data is activated. Force and torque are displayed via the interface and at the analogue output of the GSV-8. The loading of calibration data is protected by a password. The default password "Beln" can not be changed at this time. With an activated multi-axis sensor, the zeroing of individual channels is no longer possible. In the card type "Recorder Yt" the resetting of all channels can be triggered. 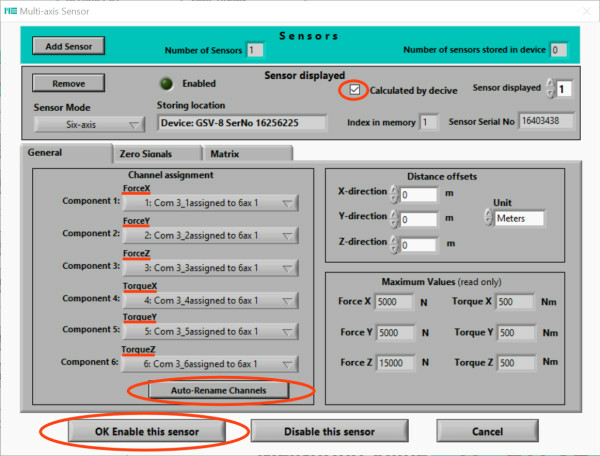 The "Disable this Sensor" button can be used to disable the application of the calibration matrix. The calibration matrix remains stored in the measuring amplifier. 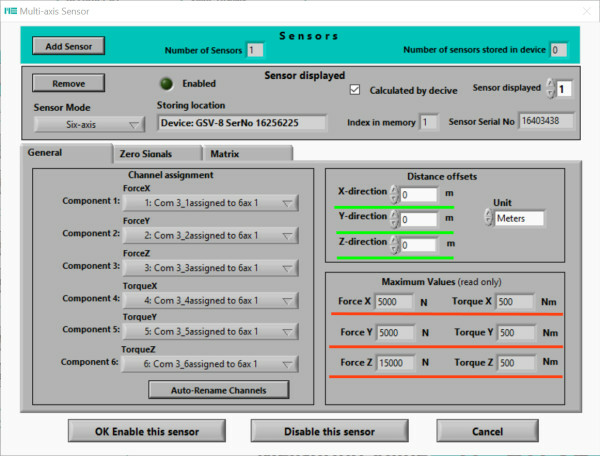 The checkbox can be set to (re) activate a saved calibration matrix. The "Remove" button removes a calibration matrix from the memory of the measuring amplifier. 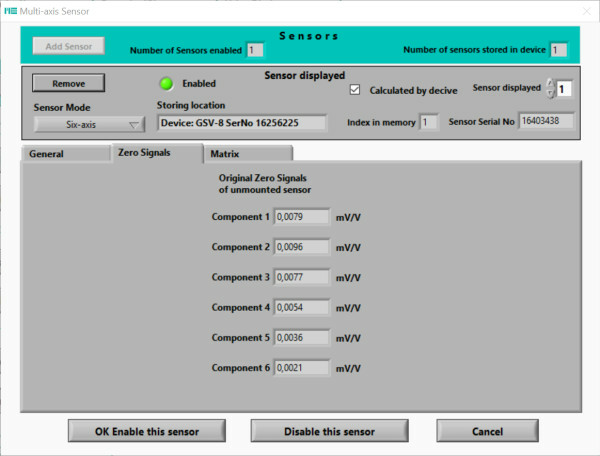 In the "Zero Signals" card type, the zero signals of the unloaded sensor are listed in the delivery state. The card type "Matrix" lists the coefficients of the matrix. 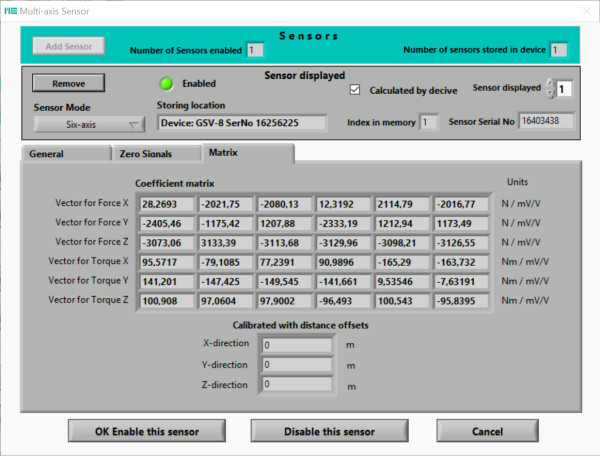 The software GSVmulti from version 1.38 allows the application of second-order calibrator data ("Matrix-Plus"). The internal calculation "Calculated by device" is (currently) not possible.